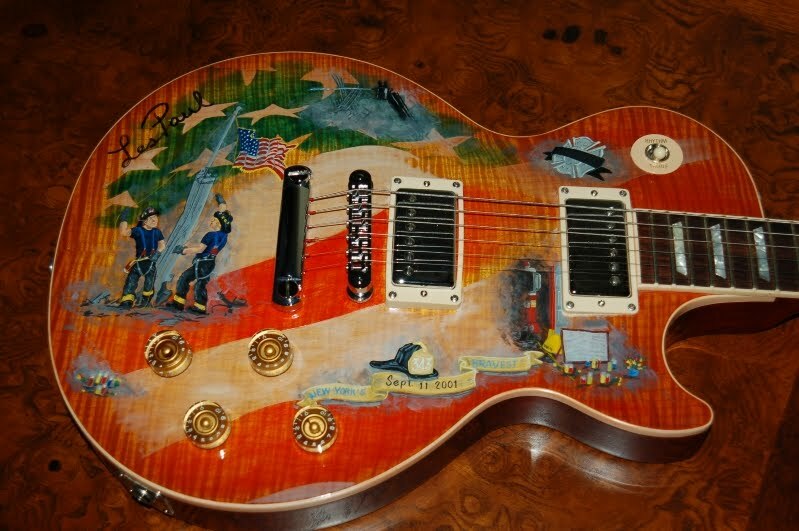 This Gibson Les Paul Standard Premium Plus was donated by Les Paul himself to raise funds for the Uniformed Firefighters' Association Widows and Childrens Fund in the wake of the September 11 tragedy. This Les Paul received a custom paint graphic by retired NYC fireman Peter Ortel and then sent to Madison Square Garden where it was displayed before being auctioned on eBay in 2002. Depicting firefighters raising the American flag at Ground Zero, the graphic is stunning and made all the more poignant by the fact that it was done by one of New York City's Bravest. Wow. That is an amazing finish on that LP. =( Deserves to go on display at one of the FDNY stations forever.